Snottapalooza at my house today, with both of the kids out sick with sore throats, coughs, and sneezing. Projectile mucus missiles shoot through the living room and cascade off of upper lips. It’s not pretty around these parts right now. When their tv intake this morning was reaching Child Protective Services intervention levels, I decided it was time to make cupcakes. I cook every day, and we do a fair share of baking, but cupcakes are just things that never make our radar, so we don’t have any favorite recipes to fall back on. Trolling the internet I came across Top 10 Cupcake lists, Top 50s, The World’s Best, Most Incredible Mind-Warping Cupcakes – whole sites devoted to these diminutive cakes baked in cups. Since I wanted something simple that the kids could help make, I set aside the Belgian Chocolate-filled Macadamia-crusted Cupcakes with Tahitian Vanilla Bean Frosting and the Chipotle-Chocolate Cupcakes with Cilantro Pesto and Blood Orange Reduction for another day, and found instead a simple chocolate cupcake recipe, which I tweaked and changed until it sounded better to me and fit the ingredients I had on hand. They turned out great, so I thought I’d share. Put milk in a large coffee mug, add your dark chocolate, and microwave until chocolate melts. Stir until fully incorporated, and set aside to cool. Add oil, milk and chocolate mixture, and vanilla, and stir with rubber spatula until fully incorporated. At this point I took a handful of chocolate toffees we had in the house, sliced them thinly, and whacked them in as well, because well, why not? Have the kids put liners in the muffin tins, and half-fill cups with batter. Bake for 20-25 minutes. Makes about 18 cupcakes. Whisk it all together and you’ll have enough to do about half of the cupcakes – double the amounts to frost the whole batch. These were a big hit, and entertained the kids for a good 30 minutes while we made them. Admittedly, our youngest sneezed a snot rocket into the dry mix as he was stirring it that had to be spooned out, so exact proportions and results may vary. Enjoy! Lol – gross and yum – delicious. 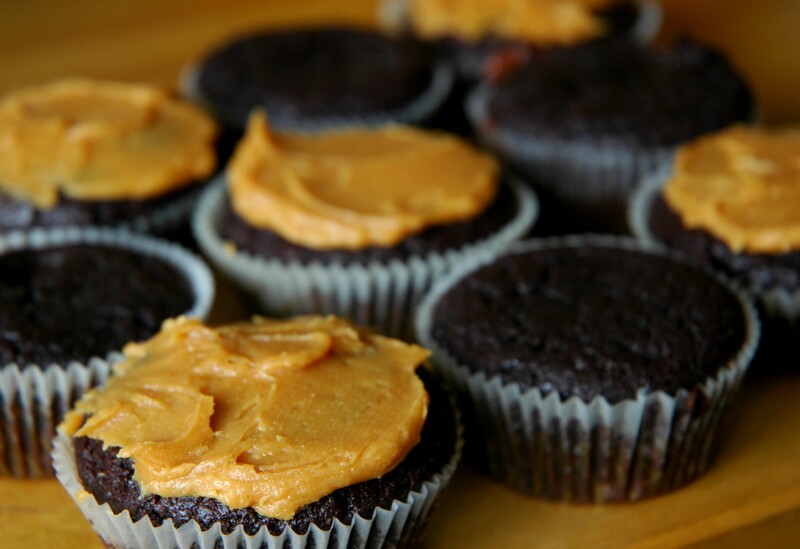 Peanut paste icing sounds worth trying, as do the cupcakes. I love moist and rich chocolate ‘things’.